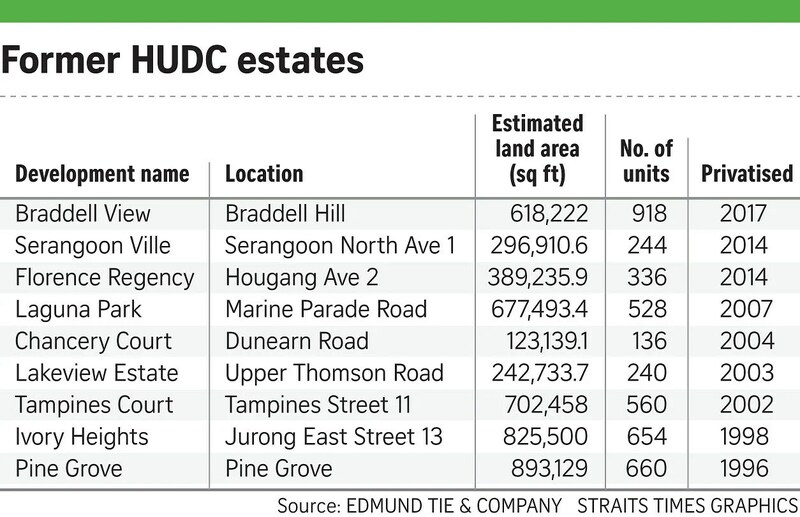 Two privatised HUDC estates are gunning for collective sales in the wake of lucrative sales of two other properties of this type – Rio Casa and Eunosville – in recent weeks. The 560-unit Tampines Court will likely launch its tender in July, while 336-unit Florence Regency in Hougang is in the early stages of the sales process. The Straits Times understands that Tampines Court owners are seeking at least $960 million for the large Tampines Street 11 site, spanning over 702,000 sq ft.
Nearly 82 per cent of owners had agreed to the sale as of Thursday, going by a Facebook page on the collective sale. This figure is, however, not official yet as residents may rescind the agreement in a five-day cooling-off period. For properties to be sold en bloc, the consent of at least 80 per cent of the owners must be obtained before a sale tender can be called. Built in the 1980s and privatised in 2002, Tampines Court has 14 blocks, with 432 maisonettes and 128 apartments. This is its third bid for a collective sale after its $405 million first try was dismissed by the Strata Titles Board in 2008. Then around 2011, it failed to obtain the level of approval that was needed from residents. “We expect more HUDC estates to start the en bloc process, due to recent successful sales,” noted OrangeTee head of research and consultancy Wong Xian Yang. Rio Casa in Hougang sold last month for $575 million and Eunosville in Sims Avenue sold for $765 million in a deal finalised this week. Both were done above the owners’ asking prices. Analysts say the recent bumper deals may tempt home owners to push up their asking prices for future en bloc tenders. “Too high an asking price may dissuade many developers from participating. Land prices are expected to rise, but I do not think we will see an accelerated rise in en bloc values,” Mr Wong added. Another privatised HUDC project, Florence Regency in Hougang Avenue 2, will also start its collective sale process soon. It is the first attempt for the development, with about 71 years left on the lease, marketing agent JLL said. “An extraordinary general meeting to start the signing process would likely be in July,” noted JLL regional director of capital markets Tan Hong Boon. Florence Regency is on a plot of about 389,000 sq ft. Since the 1970s, 18 projects were built under the HUDC or Housing and Urban Development Company scheme. All have since been privatised and nine have been sold, including Shunfu Ville and Raintree Gardens last year. HUDC sites are said to appeal to developers owing to their location in mature estates. “More importantly, the sites have more potential to be further intensified, given their layout and the size of units,” said Dr Lee Nai Jia, head of South-east Asia research at consultancy Edmund Tie and Company. However, plots that are too big may put off some bidders, owing to rules requiring developers to build and sell all units within a stipulated time frame or face hefty charges. Dr Lee said the “optimal size” for a project to have a go at a collective sale is about 300 to 500 units. Developers’ appetite for en bloc sites also hinges on the number of sites on offer in the upcoming government land sales programme. “If the increase is moderate, it is unlikely to mitigate the demand for sites from developers and collective sale sites would fill the gaps,” JLL’s Mr Tan added.